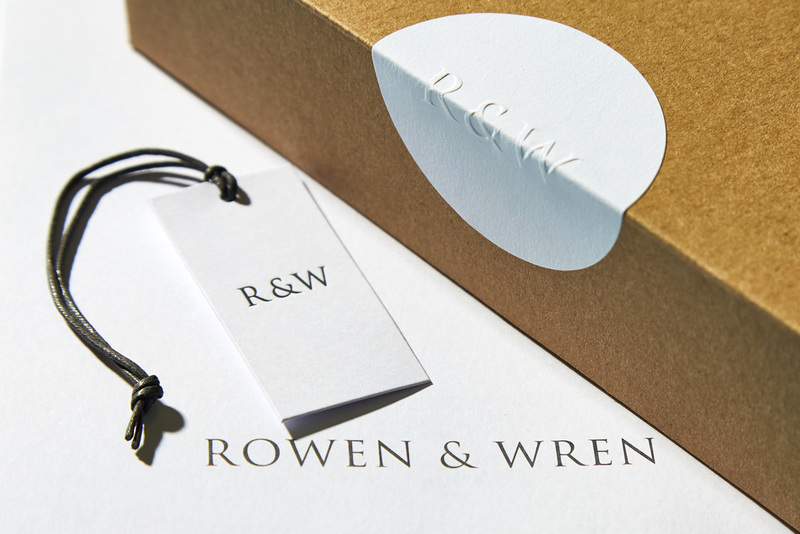 Rowen & Wren are passionate about beautiful interiors. Their website showcases a collection of stunning home and garden accessories, including furniture and lighting. Launched in 2011, they have always been fascinated by ‘eclectic design, muted colours, and simple functionality’ that sit well in both a modern day urban setting, as well as a softer looking country home. We produced a range of accessories for them, including invoice envelopes, swing tickets, and custom stickers. The envelopes were made from a 250gsm white board and printed a Pantone cool grey on both sides. The swing tickets, made from the same 250gsm uncoated board, were debossed instead of printed and had a custom-dyed waxed string attached. The stickers were made from Icy White Glassine, and then blind embossed.